The FTD Set to Celebrate Birthday Bouquet is ready to take their birthday celebration to the next level with a bright burst of color and perfectly arranged fresh blooms! Popping with personality and style, this flower bouquet brings together orange Asiatic Lilies, hot pink roses, lavender gilly flower, hot pink carnations, yellow traditional daisies, green button poms, and lush greens. 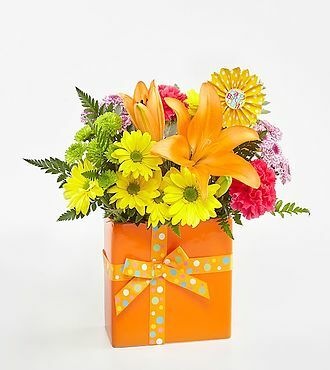 Presented in a modern rectangular orange ceramic vase tied with a polka dotted orange ribbon to give it the look of a birthday present, this flower arrangement is then accented with a Happy Birthday" pick to give it that ultimate party style. DELUXE bouquet includes 14 stems. Approx. 16H x 13W. You save over $6 at FlowersFast! (Compare to FTD retail price: $50 + $22.98 for same-day delivery.) You get the same quality, at a lower price! No extra charge for same-day delivery. FREE personalized gift message included. (Extra delivery charge for Alaska and Hawaii) Same-day florist delivery is available for this item, for orders placed before Noon in the recipient's timezone. Please see the Ordering and Delivery Information.